"Superb...a masterpiece of thorough research, deft pacing and arresting detail...Sides shows how brave Marines — officers and grunts — innovated, organized and blasted their way out of the trap their fabulously famous boss had helped set. This war story — the fight to break out of a frozen hell near the Chosin Reservoir — has been told many times before. But Sides tells it exceedingly well, with fresh research, gritty scenes and cinematic sweep." Gripping...Master storyteller Hampton Sides, specializes in captivating readers with his trademark moment-by-moment accounts...Sides captures the big personalities who run things...[and] also immerses readers in vivid accounts of horrific battles and an infamous "attack in reverse." 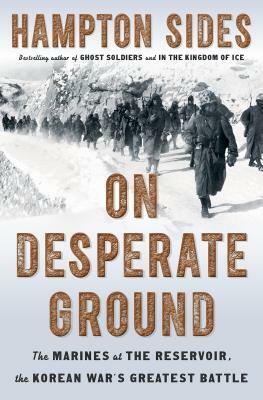 “Hampton Sides's On Desperate Ground is a heart-pounding, fiercely written account of the brutal Chosin Reservoir Campaign during the Korean War. Every page pulsates with drama. Sides, an American master of nonfiction, has written one of the finest battle books ever." "On Desperate Ground is first-rate narrative history. Hampton Sides' characters are richly drawn, his background history engrossing, and his battle scenes bone-chillingly realistic—a great read."